The windows in your home serve many functions. They protect your home and its contents from weather and the elements. Windows allow natural light to enter your home. They allow fresh air to fill your home through the screens. And they provide views of your yard and beyond. But if your windows aren’t operating at optimal efficiency, you may be spending more on your heating and cooling bills, wasting energy, and sacrificing comfort. Some window problems can be tackled by a savvy do-it-yourselfer. One common window problem, especially in older homes, is that windows don’t open and close easily. This is most common in wood windows, which are particularly susceptible to changes in temperature and humidity. Wood windows may also be stuck shut due to multiple layers of paint, since painting is a maintenance task routinely required for wood windows. To help a stuck window sash to move freely again, place a block of wood wrapped in a cloth against the bottom of the window frame and gently tap it with a rubber mallet. If this doesn’t work, insert a putty knife into the space between the sash and frame and gently tap with your mallet, working your way around the perimeter of the window. Once your window is open, thoroughly clean the tracks that the sash slides along to ensure smooth operation. Drafty windows can be caused by improper insulation behind the trim. Beefing up the insulation not only makes your home more comfortable, but you will also save money on energy bills by sealing the air leaks. Carefully loosen the trim with a putty knife then insert a pry bar to loosen the trim further, gradually working your way along the length of the trim piece to prevent drywall damage. Once the trim is removed, fill the gaps with a spray foam sealant made specifically for windows and doors. Trim off any excess foam once it’s hardened, then reinstall the trim. Cracked or broken glass requires a quick repair to keep out the elements and maintain a comfortable temperature in your home. If you have single pane windows, the repair can be fairly straightforward. Cover the damaged piece of glass with painter’s tape first to make removal easier and safer. Use a utility knife to cut around the glazing silicone and remove it, then take out the glass. Remove any remnants of silicone and old caulk. Measure the opening, then subtract 1/8″ from the height and width. Many large home improvement centers will cut replacement glass to size. Place the glass into the opening and use glazier points on each side of the frame to hold it in place. Then fill the opening with glazing putty and allow to dry. While some window repairs can be a fairly easy DIY repair, other problems can be more of a headache. If your windows are stuck shut (or won’t stay open), this is most often the function of an aging window. You may soon begin to see other problems arise due to the age of the windows, including wood rot. You can decide to continue to throw money at repairing your old windows, but at some point window replacement should be a consideration. 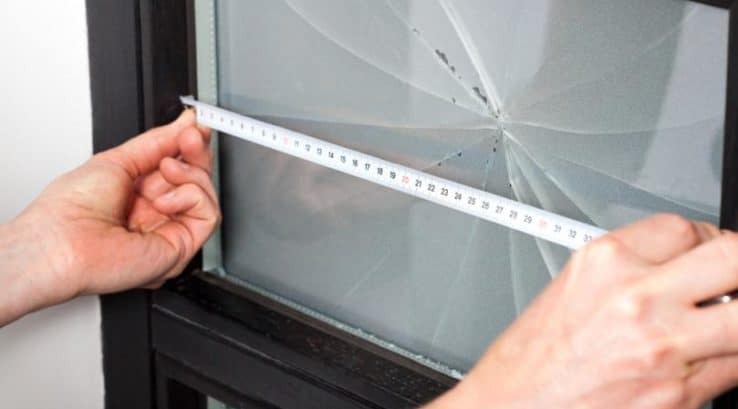 If you have broken glass on a single pane window, the replacement can be fairly easy, and not very expensive even if you decide to hire a contractor to replace the glass. But if you have a double pane window, replacing a broken pane is not as straightforward. Double pane windows have a space between the two pieces of glass that act as a thermal barrier, making the window more energy efficient. This space is often filled with a special insulating gas, either argon, krypton, or xenon. Once a glass pane is damaged, the airtight seal is broken and the gas escapes. Replacing the damaged pane will not make the window airtight, and you will have problems with condensation and fogging between the two panes. Some drafty windows are improved with added insulation behind the framing. But if your windows are drafty where individual panes meet, this again could be a function of the windows’ age. Newer replacement windows are designed to be more energy efficient and are manufactured using the latest cutting-edge technologies and materials. Replacement windows will make your home more comfortable as well as more energy efficient. This will save you money on utility bills, saving unnecessary wear-and-tear on your heating and cooling system.